Pleasanton calls AAA Fire Protection Services for all of their fire protection and suppression needs, from grease exhaust system cleaning and grease filter exchange to designing, installing and servicing entire sprinkler systems. We have the finest portable fire extinguishers and fire extinguisher cabinets, and kitchen fire suppression equipment. However, the “equipment” is never enough. What really sets AAA Fire Protection Services apart from the competition is our people. Our technicians are honestly passionate about what they do. We care about the safety of your facility and we are devoted to keeping you and your Pleasanton employees safe! AAA Fire Protection Services prides itself on handling every aspect of kitchen and industrial fire suppression and protection system installation and upkeep. We have proudly served Pleasanton since 1974. Over the years, our staff has seen every change in the technology and we keep current with the best ways to protect you and your facility. We really care! 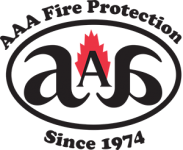 AAA Fire Protection Services is to always here to protect your industrial property.